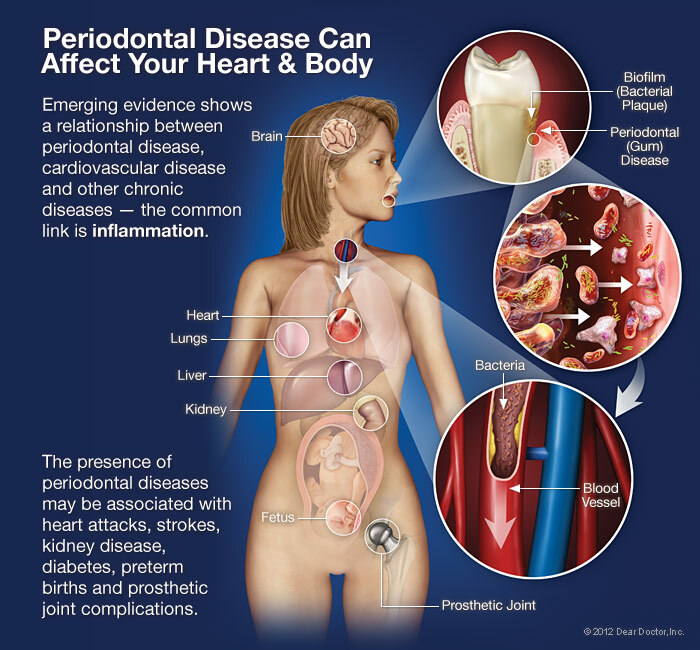 Periodontal diseases are infections of the gums that destroy the support of your natural teeth. Two major components are involved in the disease. Dental plaque and our “host” response. Bacteria found in plaque produce poisons that irritate the gums. Our body in turn responds by sending cells and chemical mediators. This reaction will cause the gums to turn red, swell, and bleed easily (inflammation). 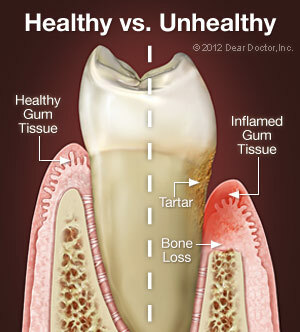 If this inflammation is prolonged, the gums separate from the teeth causing pockets (spaces) to form. Plaque can also harden into a rough, porous substance known as calculus (or tartar). This can occur both above and below the gum line. As periodontal diseases progress, the supporting gum tissue and bone that holds teeth in place deteriorate. If left untreated, this leads to tooth loss. However, don’t be fooled. With periodontal disease, bleeding, redness, and swelling do not have to be present. 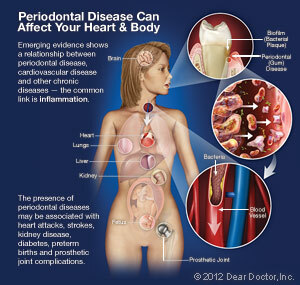 Further, pain is usually not associated with periodontal disease. This disease damages the teeth, gum, and jawbone of more than 80 percent of Americans by age 45. All periodontal therapy starts with the evaluation of your oral hygiene techniques and instruction for improving them, followed by the mechanical removal of plaque and any calcified deposits (tartar or calculus) that are present on the root surfaces. This is accomplished with a cleaning technique known as scaling, root planing or debridement using hand instruments and/or ultrasonic (high frequency vibrational) instruments. Locally applied antimicrobial products or antibiotics might also be recommended during various parts of periodontal treatment to assist in healing and pocket-depth reduction, hopefully eliminating the need for periodontal surgery. Sometimes surgical procedures may be necessary to remove the deep pockets that form between inflamed gum tissue and teeth. There are many different types of surgery to handle a variety of problems. Many times, combinations of procedures are used to attempt to reduce the number of surgeries as well as the cost of treatment. It is also possible to detect early forms of gum disease by evaluating your gingival (gum) tissues, both visually and by examining their attachment levels to the teeth. The health of your tooth-supporting bone can be assessed by taking dental radiographs (x-rays images).